During the Civil War, Missouri, was an important prize for both sides. Larger than Virginia and more populous than Georgia, Missouri produced more food than all but three of the Confederate states, and St Louis controlled the confluence of the Missouri and Mississippi rivers. Despite their reputation, most Missourians did not want to secede; they wanted a negotiated solution, and consistently voted for moderate candidates. However, Kansas Jayhawkers rarely made any distinction, nor did the Union occupying government; this forced many Missourians into supporting the South when they would have preferred to remain neutral. When the war started the Union command in St Louis quickly ejected the secessionist governor Claiborne Fox Jackson and his supporters from the central part of the state. 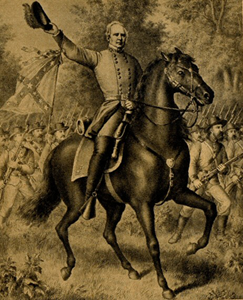 The Missouri Confederate army, composed of various state guard units and mostly unarmed volunteers led by Major General Sterling Price, fled to southwest Missouri. Union control of the rivers and railroads made it difficult for Missourians to join Price. In response, Price sent Bushwhackers in civilian clothing to destroy railroad bridges and telegraph lines before he marched back into central Missouri. In his wake rode the Unionist Kansas Senator James Lane and 1,200 Jayhawkers; Lane told his men to strip Missouri of "everything disloyal, from a Shanghai rooster to a Durham cow," On September 23,1861, they descended on the town of Osceola - one of the largest in the region, with a population of 2,000 - and burned it to the ground for its supposed support of Price. Lack of food and winter clothing, as well as expiring terms of service, forced Price to withdraw and let many of his men go; dispirited by army life, they either went home or became Bushwhackers. Too weak to move north again, Price sent partisan rangers to recruit for his force, and encouraged Bushwhacker attacks. When the Union command tracked the recruiters' movements and let them gather a sizeable group before attacking them, the mostly unarmed and untrained recruits stood little chance. The Bushwhackers had better luck, destroying infrastructure and ambushing patrols. Unable to guard every mile of track and telegraph line, on December 22 Major General Henry Halleck, Commander of the Department of Missouri, issued General Order No.31, stating that anyone caught destroying infrastructure would be shot. The ranks of the undeterred Bushwhackers swelled with deserters and paroled prisoners: deserters from Price's army found they could continue the war from the comfort of home, and paroled prisoners disregarded an oath made to a Unionist state government that had been installed by extralegal means. Union forces were as responsible as General Price for the beginnings of Missouri's guerrilla war. Many hailed from neighboring states, and arrived convinced that every Missourian was a rebel; they forced local governments to pay for damage done to the railways, and if the money was not forthcoming they took it from shop-owners and citizens. Irate Missourians soon "took to the brush" to fight a guerrilla campaign against the occupying army. In the meantime, Kansas Jayhawkers continued to raid Missouri, robbing and killing with impunity. Some bands brought armed African Americans with them; as early as November 1861, Jennison's 7th Kansas Cavalry - called "Redlegs" for their distinctive legwear - included a company of blacks led by an escaped Missouri slave. Halleck complained that "The conduct of the forces under I.ane and Jennison has done more for the enemy in this State that could have been accomplished by 20,000 of his own army. I receive almost daily complaints of outrages committed by these men in the name of the United States...". (The government ordered jayhawkers to stay on their side of the state line and relieved Jennison of his command, but the raids continued, and Jennison returned to his unit in 1863.) On March 13, 1862, Halleck issued General Order No.2, declaring that guerrillas were not soldiers but outlaws and would be killed if captured, and consequently this "no quarter" policy was adopted by the Bushwhackers themselves. On July 22, 1862, the Union command in Missouri issued General Order No.19,requiring every able-bodied man to join the militia "for the purpose of exterminating the guerrillas that infest our state." The order's immediate effect was to make Missouri's entire male population of fighting age choose sides, and a sizeable minority who could not bring themselves to fight for the Union made their way to the Confederate army or joined the guerrillas. One of the latter was a young Frank James, who had served in Price's army until left behind sick during the retreat south. He was captured, paroled, and but for the militia order he might have spent the rest of the war as a peaceful farmer. However, most Missourians did join the militia, and the Union gained 52,000 troops(though some were reluctant soldiers at best, Confederate informers at worst.) Their local knowledge enabled them to target true secessionists; but some used the opportunity to settle old scores, and since they were allowed to live off the land when in the field widespread looting further alienated an already hostile populace.